Before senators to voted to confirm Supreme Court nominee Brett M. Kavanaugh, thousands of protestors marched their way to the Supreme Court on Oct.4. Attendees ranged from sexual assault survivors to prominent figures such as Senator Elizabeth Warner and Amy Schumer. The #CancelKavanaugh protest took place as an effort to persuade senators to vote no on his confirmation. Many women and men rallied in support of Dr. Christine Blasey Ford, who accused Kavanaugh of sexually assaulting her when they were in high school 36 years ago. The protest began outside of the Barrett Prettyman Courthouse — where Kavanaugh currently sits as a judge, and continued it’s way to the Hart Senate office building. 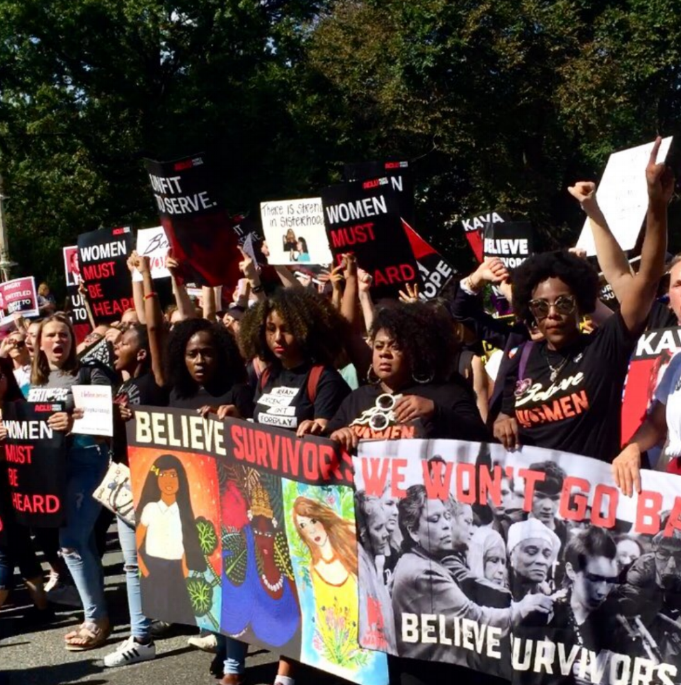 Protestors marched for their support of Ford, but they also stood in solidarity with other survivors of sexual assault and harassment. Including U.S attorney Anita Hill who accused Clarence Thomas of sexual harassment during his 1991 Supreme Court confirmation hearing. While marching protestors chanted in unison.“What do we want? Justice! When do we want it? Now!” and “Say it loud! Say it clear! Kavanaugh is not welcome here! 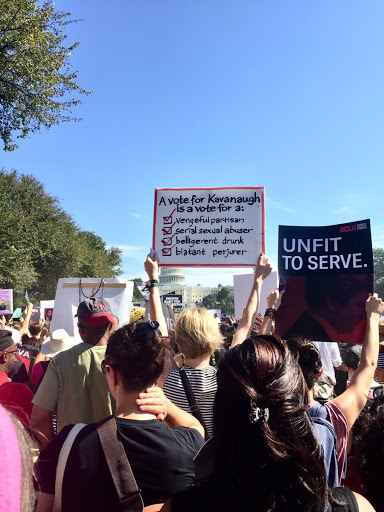 !” They shouted while holding signs that read, “Women Must Be Heard” to “Stop Victim Blaming.” Many protestors chanted, “November is coming,” in referrence to the midterm elections on Nov. 6. Their message is a warning to three wavering senators: Susan Collins of Maine, Lisa Murkowski of Alaska and Jeff Flake of Arizona, who according to CNN, supported the FBI investigation into allegations against Kavanaugh last week and were expected to have strong pull over the final vote. Women and a few men took the stage against the glare of the Supreme Court’s white-pillared facade, telling stories of sexual assault and abuse, some for the first time publicly. Among the thousands of protestors, a few women also expressed their feelings towards the protest.